Name that LEGO Book Cover! LEGOs and children’s literature have come together in the past with some pretty great results. Who can forget the LEGO Pigeon by Mark Anderson? 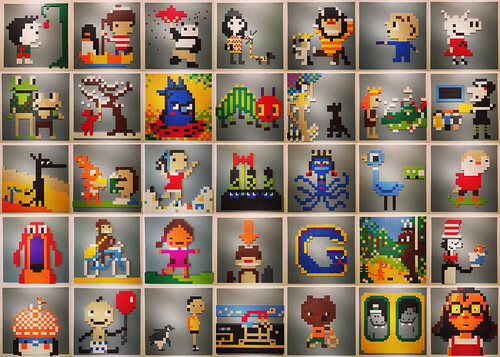 Or these LEGO creations by Hilary Leung? I used this website to (virtually) create some LEGO book covers. See how many you can get. Genius idea — I’m sure there will be a book full of these one day. I’m curious: Did you actually build these with Lego? Or is there a computer program out there that Lego-fies images? Either way, very cool! If you did it physically, that’s an impressive amount of work, too! Five out of seven. Not bad! I only got three – the same two as Lisa and No David. Still fun. I missed Bud, not Buddy ??? Later this afternoon it occurred to me this should be applied to iconic album covers as well. Here’s five from my past — can you guess what any of them are? Very Cool!! Thank you for sharing. Going to try this with my class. 6/7 for me. The last was tough, likely because it was a white background instead of light blue. My 2nd and 4th graders got 4/7. Super fun. Thanks for sharing! Did you edit the book cover (remove or change some of the colors) a little after you uploaded the picture to make it a little more challenging? I love the idea so I am trying it, but it seems like all the covers I have uploaded, students would know too quickly. May I use some of your book covers for a “Guess the Book” program at our public library in Rochester NY? Thanks. These are totally awesome. I missed Bud, not Buddy and The BFG, but the others jumped right out at me! Fun!